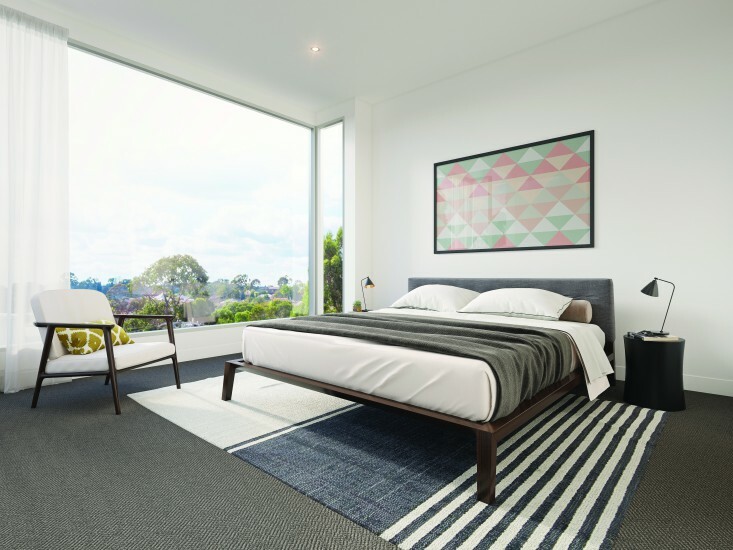 Fenn Developments is giving you a chance to join the action with their new apartment project CAPE in the leafy, tree-lined suburb of Heidelberg. In the north-east of Melbourne, there is a place where the streets boast a vibrant café and shopping culture, where more and more people are buying property on the tree-lined streets. That place is Heidelberg, and now, Fenn Developments is giving you a chance to join the action with their new apartment project CAPE. Overlooking the Yarra parklands to the hills and mountains beyond, the 31 boutique residences at CAPE are perched on a street rise adjacent to the thriving Burgundy Street retail and hospitality precinct. Designed by Peter Brown Architects, the oversized open floor plans are enhanced by natural colour schemes, lending interiors the feeling of spaciousness and warmth. 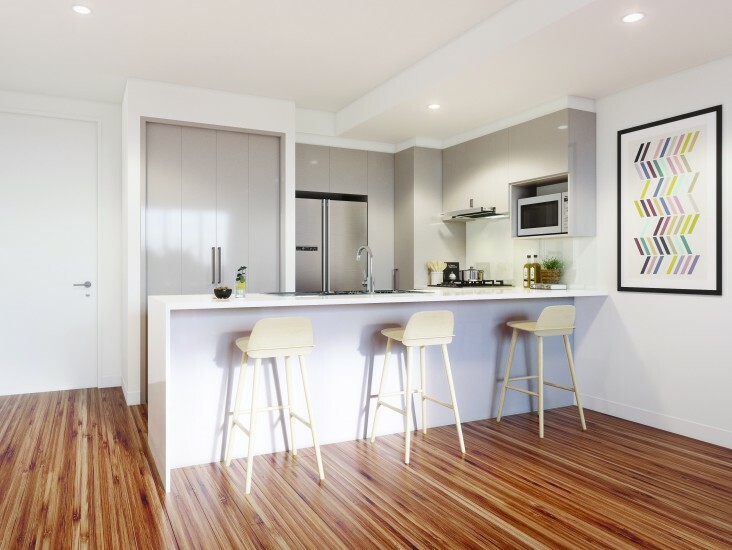 With immaculate, polished elements like the beautiful large stone benchtops and glass splashbacks, the kitchen is the modern heart of these homes. Cooking will be a seamless and easy affair, as every residence includes premium European appliances. Like the kitchens, bathrooms are clean and modern. The refreshing, minimalist approach means the polished stone benchtops and large format tiles become focal points in the room. Integrated storage and the inclusion of recessed lighting shows a commitment to excellent design. Ensuites connect to bedrooms that are flooded with natural light. These textured spaces display beautiful stone and wood finishes, in keeping with the rest of the interiors and Heidelberg’s leafy, tree-lined streets. Only 12km from the city, Heidelberg is emerging as a real gem in Melbourne’s north-east. The suburb is imbued with a village-like charm, with period homes sprawled along verdant boulevards and surrounded by parklands. As Burgundy Street is at the doorstep, finding somewhere to brunch in the mornings will be a breeze. The Sycamore Tree, a trendy social enterprise café, offers aromatic coffee while The Train Yard operates as both café and pub, with the usual brunch items making way for a more hearty lunch menu come midday. On the weekend, locals can be found exploring the many reserves nearby. Heidelberg Park is an excellent spot for a Sunday barbecue – take a football down and play on the expansive oval while the kids explore the playground. From there, it is easy to access the Yarra Trail for an afternoon cycling adventure. Residences at CAPE are ideal for a range of home buyers. From first homeowners to downsizers, city professionals to established families – there’s something for everyone. These homes are also a lucrative investment, as the suburb has undergone close to $600 million in investment in the Heidelberg Hospital precinct. This has attracted more and more professionals to the area and has increased the demand for quality residences. And, with its high-quality design and construction, CAPE is sure to be a major drawcard. Enquire here to find out more about the apartment offerings at CAPE.